← PESTS IN THE GARDEN—WHAT’S BUGGING ME? 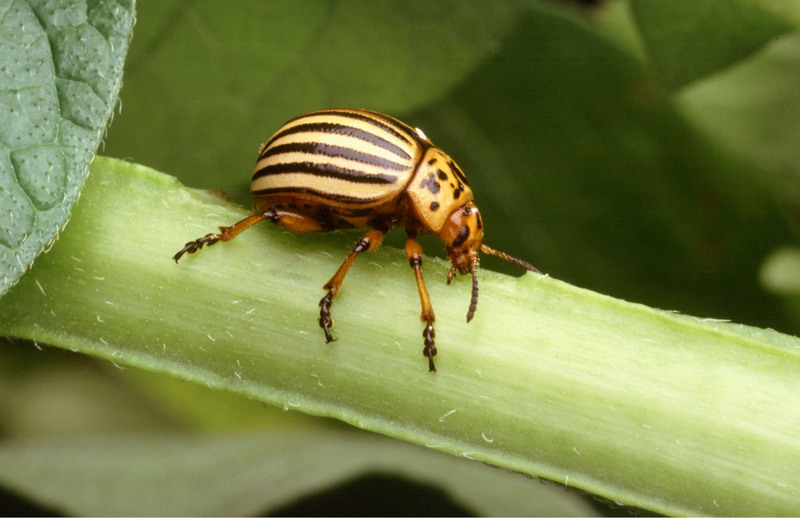 The Colorado Potato Beetle (CPB) became a pest when settlers brought potatoes into the Rocky Mountain area, the native habit of this beetle. The beetle preferred the potato to its host weed and has spread to become a serious pest throughout the US and Eastern Canada. The CPB feeds on the leaves and terminal growth of the nightshade-family plants, such as potato, tomato, and eggplant. The potato, however, is its preferred plant. The above-ground destruction of potato plants can cause severe reduction in tuber size and overall yield. CPB larvae grow to about ½-inch long with a semi-spherical “humpback” shape. They are a shiny reddish-bronze color, having two rows of black spots on either side of the body. The adult is a distinctive yellow and black striped beetle, with ten black stripes running along the length of the wing covers. The beetles are convex, about 3/8” long and 1/4” wide. The eggs, orange-yellow in color, can be found in clusters, usually on the underside of leaves. Rotate potatoes to a new spot in the garden each year to foil the adult CPB who have overwintered in the soil of last season’s potato patch. In cases of severe infestation, consider not growing potatoes for a year to interrupt their life cycle. In the early stages of plant development, floating row covers will protect potatoes against overwintering adult beetles. As soon as leaves emerge, begin checking foliage frequently for the presence of egg-laying adults, yellow-orange egg clusters on the undersides of leaves or the humpbacked, brick-colored larvae. Crush egg masses, handpick insects and drop into a pail of warm, soapy water. For small home plantings, handpicking alone may provide adequate control of this pest. A biological pesticide based on a strain of Bacillus thuringiensis (Novodor) is still registered in NH. It is most effective on young larvae.